You enter the Huddersfield Narrow by going, Harry Potter-like, though a concrete wall. That is, you go under a road which had been widened while the canal was closed, leaving only a pipe for the water. The reinstatement of a bridge here by the then County Council was one of many such blockage removals which enabled the canal to be reopened. Straight away you pass an old warehouse and reach the first of the 42 locks which will take you up to the moors. You are going through the University here. Pass straight through the head of the next lock chamber and into a new cutting which gets you under a factory, through two new locks, and emerge beside another college which takes full advantage of its city centre canalside. Stop if you need it at the nation's biggest chandlery chain (B&Q) then go under a rather elemental lattice railway viaduct and into an unfrequented back part of the town. 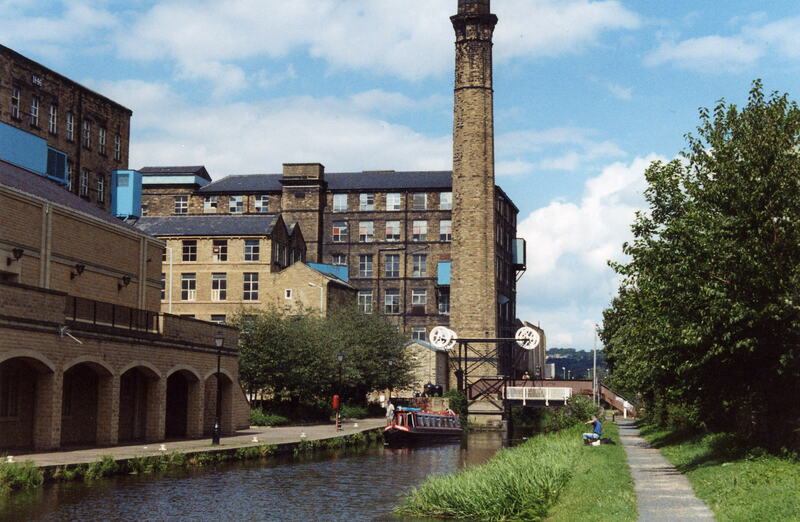 You emerge in Milnsbridge, with a succession of determined mill conversions and new buildings. Moor at the wide and explore quite a useful compact high street. 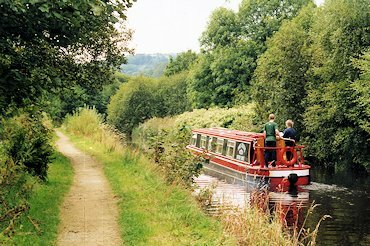 The locks are close together as you climb rapidly up the Colne Valley to Golcar, which has an attractive tight-bended aqueduct taking the canal onto the other side of the river. There's a small museum of weaving life here. Across the widening valley bottom is Titanic Mill, everything its name implies and converted into super-posh flats - sorry, apartments. You go on through pretty woodland, and past not-yet-restored mills. Don't neglect the steep walk across fields to the Olive Branch. In a while you get to Slaithwaite, which gave the restorers a real headache because the canal had been comprehensively eliminated. The measure of their success is how well the canal seems to fit into the town. Slaithwaite make a good overnight mooring. More woods and enticing views of the hills bring you to the bottom of the Marsden flight. These last twelve locks take you quickly up above the town to the summit. You need to moor here till it's time for your tunnel passage, so walk down into the town and find useful shops and a good choice of pubs plus one by the canal at the railway station, and the Tunnel End. Visit also the Visitor Centre, with excellent material and audio-visuals on the canal, building the tunnel, packhorses before the canal, and centuries of social history. Now comes the highlight of your journey. Accompanied by a knowledgeable person from Canal & River Trust, plunge into the inky depths below Marsden Moor. Soon the tunnel bore opens out into naked rock, and your guide will show you the marks where the navvies bored hole by muscle power ready for blasting of the rock. After a couple of hours you emerge in Lancashire. The Diggle Hotel beckons, then you sweep down the flight, with extensive views, before passing under an amazing viaduct and over Old Sag, a little aqueduct, and arriving in Uppermill. This is worth a decent stop, with shops, pubs and in interesting museum of local life. The canal now drops away through a mixture of greenery, new development and sites whose owners haven't yet seen the light; always changing and always interesting. Greenfield makes a good stop. Rather suddenly you arrive in Stalybridge, a town not without its problems but also with real charm. There's a Tesco right by the canal, and streets of shops nearby, criss-crossing the canal, large parts of which have been rebuilt from scratch. Below Stalybridge there is a short rather grotty stretch which perks up below the bottom lock at the invisible junction with the Ashton Canal, and leads through a tunnel under an ASDA to Portland Basin, which has a fascinating and extensive museum in a reconstructed warehouse and a candidate for the most graceful footbridge anywhere on the canals. 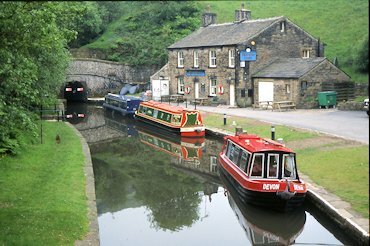 The Huddersfield Narrow packs 74 locks into 20 miles and reaches the highest point on any English waterway, with the longest tunnel. It makes an unforgettable journey. The Huddersfield Broad is like the Calder & Hebble without the handspikes. Don't lift the gate paddles too soon as you go up, and keep away from the cill as you go down. There is neat lift bridge which you work with a CRT key, and can have fun with in rush hour. 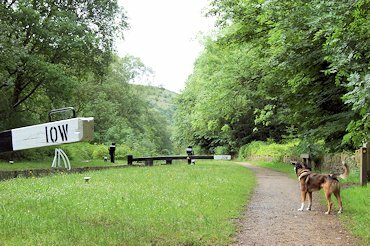 The Huddersfield Narrow is freely available from either end up to points some way below each side of the summit - Lock 32W and Uppermill. Between these points traffic is controlled to limit demands on water and staff time. 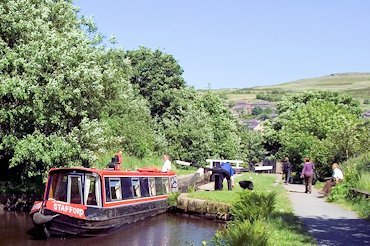 Passage over the summit and through Standedge Tunnel is available on Monday, Wednesday and Friday, and must be booked (0303 0404040). Limited passage may also be available to boats wishing to moor at Marsden without going through the tunnel. Water supply is restricted, and boats are asked to keep at least two locks between them, to give time for recovery. 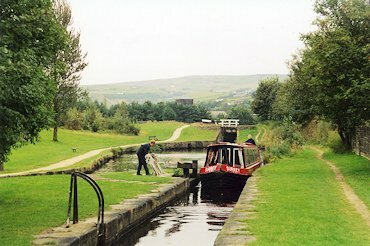 If a large part of the attraction of the Huddersfield Narrow to leisure boaters is its sheer improbability, its ill-chosen route meant it was the most challenged of the three trans-Pennine canals (or four if one counts the High Peak Tramway linking the Cromford Canal with the Peak Forest). 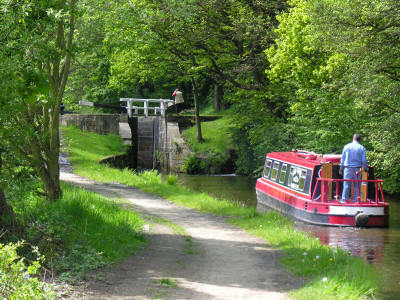 The route was chosen not as the best route across the Pennines, but because the Ashton Canal wanted access to Yorkshire. It became inevitable to cross Marsden Moor, but in order to obtain water in crossing the watershed it was necessary to go across at a lower level, hence the tunnel. The canal itself was built quickly enough, completed by 1799, only four years after the Act. The tunnel took another twelve years, eating money and lives. To get the Act against opposition from mill owners, the company had to agree to take no water from the rivers beside which the canal was built. Thus it was fed entirely from reservoirs. So the canal opened fully in 1811. 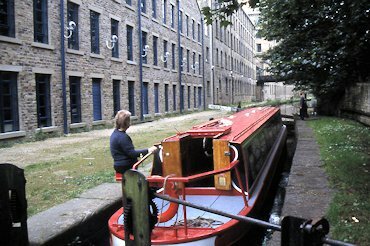 It faced difficulties over the change of gauge at Huddersfield, and short narrow boats were built to avoid transhipment but of course could carry less. Competition from other canals affected revenue. Then by the early 1840s the railways made their move, and as early as 1845 the canal had sold out. 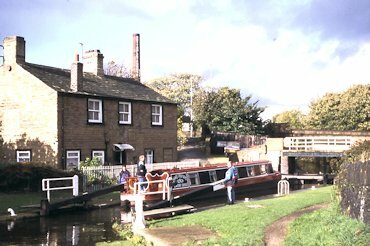 Traffic on the canal held up well for most of the century, but became concentrated at the ends; traffic through Standedge had finished by as early as 1905. By the end of the First World War there was little moving, and the Huddersfield narrow fell victim to the notorious LMS abandonment in 1944. So the HNC was one of the canals which was nationalised in 1948 because it was part of a railway. It was maintained as a water channel, and the locks were gradually filled in and the bridges dropped. It was in a pitiful state when in 1974 the people who had achieved the reopening of the Ashton and lower Peak Forest looked around for something to do. A stunning campaign was run by the Huddersfield Canal Society. Hearts and minds were converted, and the money started to follow. British Waterways gradually played a more active part, going way beyond what they were supposed to do - maintain the canal strictly at lowest cost as a water channel. Since the canal reopened in 2001, further huge steps have been made in improving the locks and reducing leaks. There are still challenges ahead, not least the legacy of that early concession, not to use river water. But the canal has definitely come back to robust life; a miracle.